For decades, the public has sympathized with Israel over the Palestinians and that remains the case today. 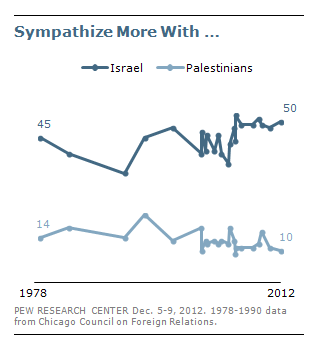 Overall, five times more Americans sympathize with Israel than the Palestinians. In a survey conducted after last month’s conflict between Israel and Hamas forces in Gaza, 50% said they sympathize more with Israel, compared with just 10% who said they sympathize more with the Palestinians. Almost a quarter (23%) did not offer an opinion while 13% volunteered that they sympathize with neither side, and 4% said both. In May, 48% sided with Israel compared to 11% who backed the Palestinians. There continue to be stark partisan differences in Middle East sympathies. Conservative Republicans maintain strong support for Israel, with fully 75% saying they sympathize with Israel compared with just 2% who sympathize with the Palestinians. By contrast, liberal Democrats are much more divided: 33% sympathize more with Israel, 22% with the Palestinians. Independents sympathize more with Israel by a 47% to 13% margin.